The branzino is a Mediterranean sea bass. It is prized for it's moist white flesh and skin that, when properly prepared, comes out deliciously crispy. The branzino is beautiful when served whole, either grilled or roasted. It is particularly suited for this presentation as it is relatively easy to filet at the table. In some cases it is also served as filets, though it is rarely as moist or flavorful as when cooked on the bone. Most market-sized branzini are 1 to 3kg, though in the wild they can grow considerably larger. Juvenile fish have black spots on its back and sides. Adult fish have silver sides and a white belly. Its flanks are light gray and its back is grey. The flesh of the fish is white. Colors: light grey to grey, juveniles have black spots on their back and sides while adults are silver sided with siver-white bellies. Choosing: Choose fish that do not smell fishy. Fresh fish have a clean, oceanic aroma. When buying whole fish, make sure the eyes are clean and clear and not cloudy. Also, the eyes should be moist and full sized, not dry or sunken. The gills should be vibrant in color and not dull. When hung by the head, the fish should not be limp. The firm white flesh of the branzino make it wonderfully suitable for roasting or grilling whole, baked whole. Parchment pouches, and salt domes are equally appropriate for use when cooking this fish. Branzino can also be deep fried. Generally branzino can be used in any recipe calling for bass. Cleaning: If a whole branzino is bought, you should begin cleaning by removing the fins. Next, gently scrape away the scales without ruining the skin. Once the fish is scaled, slice open the fish's belly and remove the guts. Gently rinse the carcass under cold running water, inside and out, then pat dry. 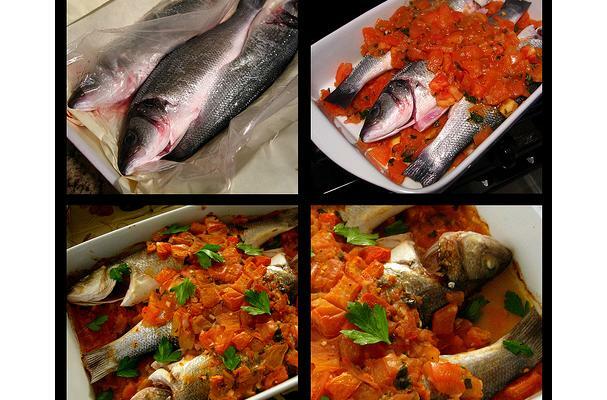 Branzino, if fresh, can be stored in the refrigerator, thoroughly wrapped in plastic wrap, for up to two days. Wrapped and bagged, branzino will keep in the freezer for up to 90 days.